Today we offer you to familiarize yourself with another drug of drug company Research Body. 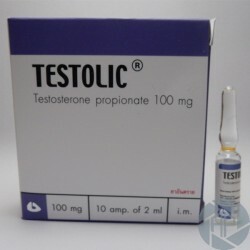 The basis of the active ingredient of the drug is testosterone propionate. This transmission of all the esters of testosterone known today is the most effective and prolonged exposure. In addition, unlike other esters is less conducive to fluid retention in the body, which of course is a very positive thing. This steroid is used mainly to stimulate muscle growth, improves and increases the physical strength and endurance athlete muscles, helps to maintain stable appetite. Now, regarding the dosage. On average, the optimal dose of the doses of the drug are in the range of 50-100 mg every day. The drug can also be used by women and bodybuilders, but in this case, as in many others, the dosage will be minimal amount of a substance in order to avoid excessive exposure to the female body and the occurrence of adverse effects. For women, the dose will be between 25-50 mg of material. Among the most common side effects seen in athletes, such as acne, Gynecomastia, hair loss, prostate enlargement. As a general rule such side effects occur as a result of a significant drug overdose. Therefore, the competent and safe solution to the observance of the optimal dose and timing of the course. Women may experience masculinization. The drug has a good properties anabolic, can significantly increase the muscle mass of the athlete, leads to its quality.